Wahama freshman Emma Gibbs (7) spikes the ball past a Ravenswood defender during the Lady Falcons’ tri-match on Thursday in Mason, W.Va.
Wahama senior Madison VanMeter (10) receives a serve in front of teammate Harley Roush (21), during the Lady Falcons’ tri-match on Thursday in Mason, W.Va.
MASON, W.Va. — One last tune-up before the postseason. After an week-long layoff, the Wahama volleyball team fell to non-conference guests Huntington St. Joseph and Ravenswood in a tri-match on Thursday evening at Gary Clark Court, in the Lady Falcons’ regular season finale. In the opening match of the evening, Wahama (5-20) fell behind early, but took the lead from Lady Irish (20-12) at 8-7. The Lady Falcons led by as many as four points in the first game, but St. Joseph reclaimed the edge at 18-17. Wahama tied the game at 19, but the Lady Irish claimed the next six points, winning the game by a 25-19 final. SJHS led wire-to-wire in the second game, boasting a side-out percentage of 100 on its way to the match-sealing 25-8 victory. For the match, St. Joseph held a 67.9-to-36.7 advantage in side-out percentage. The Lady Falcons — who committed 11 hitting errors in the loss — finished with a serve percentage of 64.3 in the opening match, missing a total of 10 serves. Madison VanMeter, Gracie VanMeter and Makinley Bumgarner each had two points and one ace to lead the Lady Falcons. Elizabeth Mullins earned two points of her own, while Emma Gibbs chipped in with one point. Gibbs, Mullins and Hannah Billups each had two kills for WHS, while Madison VanMeter and Gracie VanMeter added one apiece. Gracie VanMeter and Alexis Mick both had three assists to lead the Red and White. 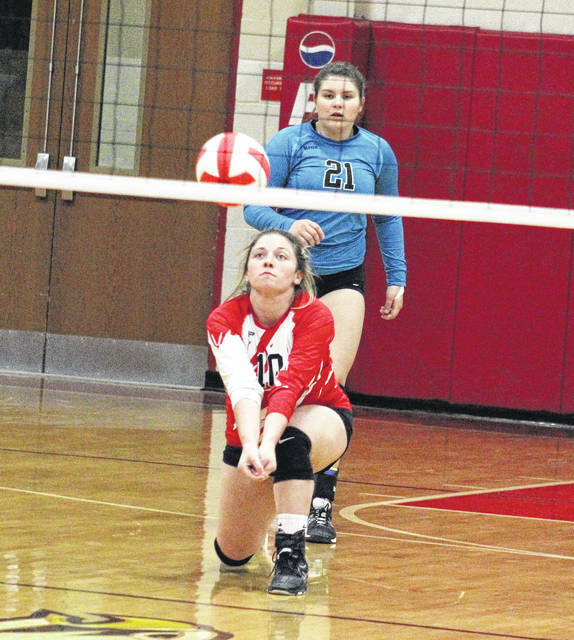 Wahama’s defensive, which came up with a total of 37 digs against the Lady Irish, was led by Bumgarner with 10 digs and Harley Roush with nine. Laura Rabel led the Lady Irish with nine service points, followed by Hannah Stapleton with seven. Erika Turner and Brooke Ferguson each marked five points, Julie Ignatiadis chipped in with four, while Rhyan Hunter earned one service point. After Ravenswood (30-12) claimed a 2-0 win over St. Joseph by counts of 25-15 and 27-25, it was Wahama’s turn to deal with the Red Devilettes. After a pair of early lead changes in Game 1, it was the Lady Falcons — who dropped a 2-0 decision to RHS in a Sept. 23 tri-match — who began to pull away. 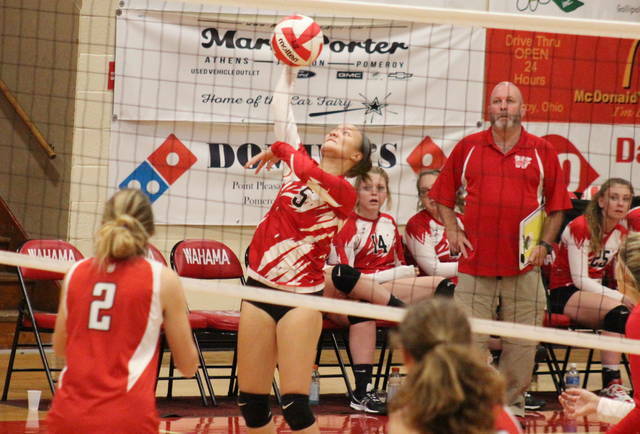 Wahama posted 15 kills in the opening game alone, earning a 25-14 victory with the 11-point final margin being the largest WHS lead of the night. The Red Devilettes scored the first four points of the second game, but Wahama fought back to take the lead at 8-7. 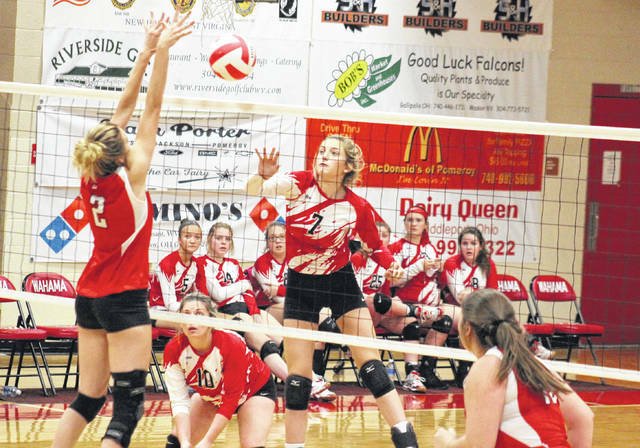 The Lady Falcons stretched their advantage to three points, but Ravenswood regained the egde at 17-16. RHS pushed its lead as high as five and ultimately won the second game by a 25-21 final. Ravenswood claimed a wire-to-wire 25-16 victory in the third game, leading by as many as 11 points en route to the match-sealing win. For the match, Ravenswood finished with a side-out percentage of 47.6, while WHS earned a 41.3 side-out percentage. The Lady Falcons had 12 hitting errors, while RHS committed 18 hitting errors. Wahama finished with seven serving errors for a serve percentage of 88.9, while the Devilettes missed only two serves and boasted a serve percentage of 96.8. 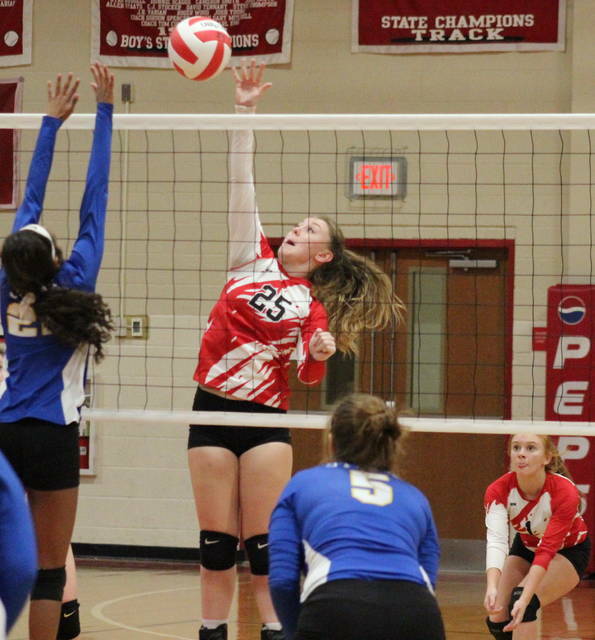 Roush led the Lady Falcons with 11 service points, including four aces. Mullins earned six points for the hosts, while Billups and Bumgarner each added five points, featuring a pair of aces by Billups. Madison VanMeter finished with three points, Gracie VanMeter contributed two points and one ace, while Victoria VanMatre had one point on one ace. Mullins and Roush led the WHS attack with five kills apiece, followed by Bumgarner and Madison VanMeter with four kills each. Gibbs earned three kills and three blocks in the setback, Billups recorded a pair of kills, while Mick and Gracie VanMeter both added one kill. Madison VanMeter had a team-high six assists against RHS, while Roush led the defense with 13 of the team’s 39 digs. Ravenswood was led by Katie Mellinger with 14 points and one ace. Kendall Bowen was next with 10 points and an ace, while Molly McCutcheon and Jazlyn Skeen each contributed three points, with an ace by McCutcheon. Rylin Tabor and Skylar Mace both had two points and one ace in the win. Mace led RHS at the net with 19 kills and two blocks, followed by Mellinger with seven kills and one block. The Lady Falcons will begin the sectional tournament next, opening postseason play against Williamstown on Monday at Parkersburg Catholic High School.